When will be When the Boat Comes In next episode air date? Is When the Boat Comes In renewed or cancelled? Where to countdown When the Boat Comes In air dates? Is When the Boat Comes In worth watching? When the Boat Comes In is a British television period-drama produced by the BBC between 1976 and 1981.The series stars James Bolam as Jack Ford, a First World War veteran who returns to his poverty-stricken (fictional) town of Gallowshield in the North East of England. 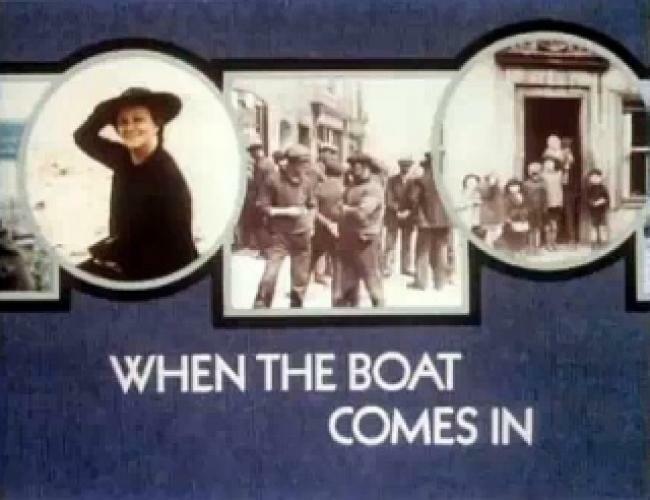 The series dramatises the political struggles of the 1920s and 1930s and explores the impact of national and international politics upon Ford and the people around him.The memorable traditional tune "When The Boat Comes In" was adapted by David Fanshawe and sung by Alex Glasgow for the title theme of the series. Fanshawe also composed the incidental music.The BBC revived the series in 1981, with the fourth series telling the story of Jack Ford as he returns to Britain penniless, after six years spent bootlegging in the United States, and follows him as he sets up in London. Having made money from his deal with the oil company, Jack is mixing in London high society. His land agent, Frank, asks Jack to broker the sale of an expensive emerald necklace to Morty Black. The necklace is owned by Philip Martin whose sister, Jane, is unbalanced and would kill to get the necklace for herself. The sale goes ahead. When Jack learns that Morty paid off the mobsters who were after him, he waives his share of the price. Lady Caroline invites Jack to visit her in Northumberland. Sarah is seeing Stan Lidell. Jack helps shopkeeper Manny Goldstein who is being persecuted by Blackshirt thugs. At a function given by Caroline's husband, Edward Mostyn, Jack argues with the local Fascist leader, Hector Smith-Jameson, which attracts him to socialist guest, Tania Corley. Jack buys a share in Manny's shop and when the thugs attack it again, he forces Smith-Jameson to pay compensation or face prosecution, and then exposes him for having paid money to a Jew. Tania's mother, Lady Leamington, gives a party to raise funds for the victims of Franco in the Spanish civil war. Billy treats Bob Randall, son of Jack's old sergeant-major Fred, wounded fighting for the Spanish Republicans. Jack considers himself in debt to Fred who once saved his life. Jessie and Billy get Fred to persuade Jack to smuggle guns to the Republicans. Using a pleasure cruise as cover, Jack sails for Spain with Tania, Jessie, Billy and communist Nigel Scott-Palliser. Jack learns from Ceddie Corley that Scott-Palliser is planning to have him arrested for gunrunning. He sends Tania home, warns the ship's captain and goes ashore with the ship's steward, Raoul Savory. Jessie is shocked to discover that Scott-Palliser plans to give the guns to the Communists and not the Socialists. Raoul diverts the Communist convoy. Jack, Jessie, Billy and Raoul set off to deliver the guns to the socialists. They fight off Franco's Moorish cavalry, but Scott-Palliser is lying in wait and shoots Jack. When the Boat Comes In next episode air date provides TVMaze for you. EpisoDate.com is your TV show guide to Countdown When the Boat Comes In Episode Air Dates and to stay in touch with When the Boat Comes In next episode Air Date and your others favorite TV Shows. Add the shows you like to a "Watchlist" and let the site take it from there.